By Eric Thomas: Undefeated WBO super featherweight champion Adrien Broner (22-0, 18 KO’s) faces what could be the toughest test of his still young three year pro career against undefeated No.1 World Boxing Organization ranked contender Eloy Perez (23-0-2, 7 KO’s) on HBO on February 25th at the Scottrade Center in Saint Louis, Missouri. Broner, 22, is a Floyd Mayweather Jr. clone, from the way that he uses Mayweather’s shoulder role to his habit backing into a corner to lure his opponents in so he can land short precise check left hooks and short right hands. Broner is like the super featherweight division’s version of Mayweather and HBO is pretty excited about this guy’s potential in the future. 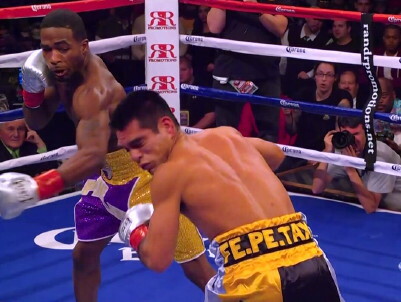 Already, Broner has beaten excellent fighters like Jason Litzau and Daniel Ponce De Leon. Now Broner is trying to add the 25-year-old Perez’s scalp to his resume. This could be a tougher test than Litzau and Ponce De Leon because Perez is faster than those guys and kind of explosive on the inside. He’s got an excellent left hook that he can hurt you with when he gets in close. Perez has a lot more power than his record would indicate. In his fight against Daniel Jimenez last September, Perez had Jimenez down twice in the first round with left hooks to the head. Perez was very effective in coming forward and getting in close to throw his short power shots. He kind of reminds me a lot of Timothy Bradley with his short arms and tendency to get in close. However, Perez isn’t much of an outside fighter and he’s not in Broner’s class in terms of power either. I give Broner the edge in hand speed, defense and a big edge in power. Still, Perez is dangerous with his left hook and Broner is going to have to show that same Mayweather-like defensive skills if he wants to avoid getting dropped in this fight. I expect Broner to make adjustments if he does get knocked down, but it’s better he not hit the canvas in the first place because Perez is vicious when he smells blood.